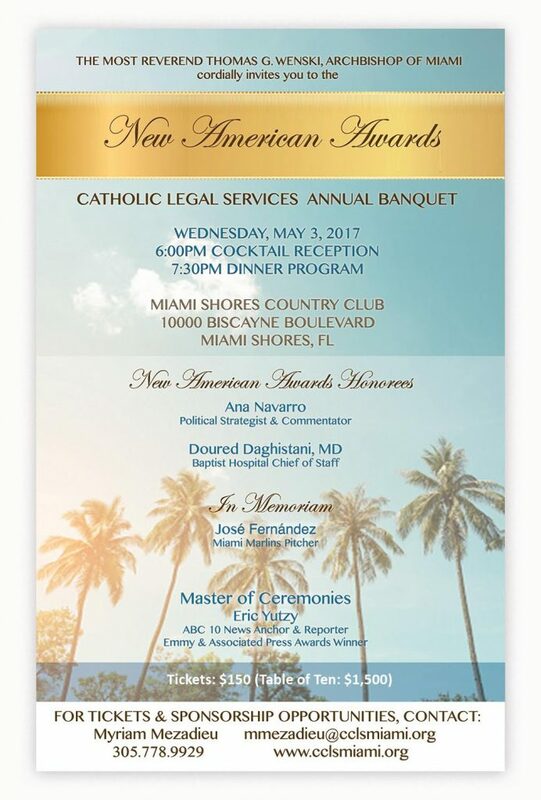 The 2017 New American Awards - Sánchez-Roig Law, P.A. Sánchez-Roig Law Firm, P.A. is honored to support Catholic Legal Services of Miami (“CLS”). Bruce Solow is President of the Board of Directors of CLS and Rebeca Sanchez-Roig is a Board Member. Founded in 1998, CLS provides a full range of immigration-related legal services, and focuses exclusively on helping poor immigrants, refugees, and impoverished people obtain asylum, establish legal residency, become citizens, and reunite families. Most of CLS’s services are provided free of charge for qualifying clients or for a nominal fee to those who do not qualify. CLS’s clients include newcomers, detained individuals, victims of domestic violence, human trafficking survivors, individuals without legal status, people with criminal histories, juveniles, individual with physical/mental disabilities, torture survivors, and others. CLS serves clients without reference to their race, religion, gender, ethnic group, or other distinguishing characteristics. We invite you to consider sponsoring CLS’ outstanding work and contributions to our community by attending its New American Awards annual fundraising banquet, on Wednesday, May 3, 2017 at the Miami Shores Country Club.